Ag producers, business representatives and community leaders from across the county attended the annual Farm-City Week dinner, held Tuesday, September 19 at the Lockhart-Taylor Center of South Piedmont Community College in Wadesboro. The event was held to emphasize the collaborations between the agricultural industry and the business community, with 148 in attendance. Outstanding individuals were also recognized and awarded plaques for their dedication to agriculture and business. Farm-City Week observances take place around the nation each year to strengthen the understanding of farm-city connections that provide our food, fiber and shelter. 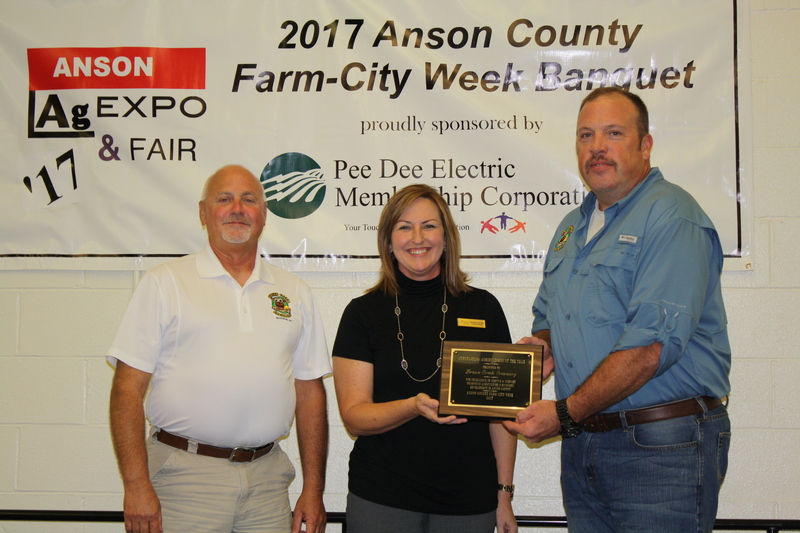 Anson County is fortunate to have strong ties that appreciate its agricultural base and its importance to the local economy. 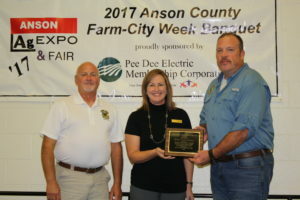 The Anson County Chamber of Commerce and Brown Creek Soil and Water Conservation District joined the Anson County Cooperative Extension staff to host the evening. The event combined the annual Farm-City Week observances with Brown Creek’s annual awards dinner. Sponsored by Pee Dee Electric, guests were treated to a reception before the event, followed by a barbeque buffet. The evening program highlighted agriculture, award recipients, and entertainment. Plaques given during the evening included Outstanding Farmer of the Year, awarded by Anson County Cooperative Extension, to Todd Moore, Todd Moore Farms. 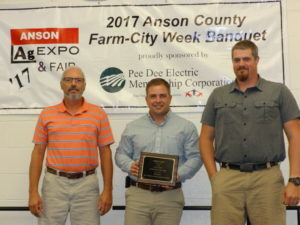 Oustanding Agribusiness was awarded to Brown Creek Creamery, received by Jeff Poplin and Robert Stovall, and presented by the Anson County Chamber of Commerce. 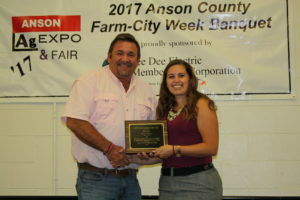 Brown Creek Soil & Water Conservation District recognized the Anson County Conservation Farm Family, Barkman Farms. Receiving the recognition were Galen and Kyle Barkman. The evening’s entertainment was comedian Mike Goodwin of Columbia, SC. Goodwin entertained the group after dinner with a show of humor and fun, emphasizing the southern peculiarities that makes us all laugh. This year’s event kicked off a week of observing and celebrating agriculture in Anson County. The week ended with a Family Fall Fest at Circle G Arena, the annual Ag Fair at the Extension Center and 4-H Youth Livestock Show at Circle G Arena in Lilesville. Shelby Emrich, Chamber Director, presents the Outstanding Agribusiness Award to Jeff Poplin and Robert Stovall with Brown Creek Creamery. Jake Barbee, Soil & Water Resource Conservationist, presents the Conservation Farm Family Award to Galen and Kyle Barkman of Barkman Farms.